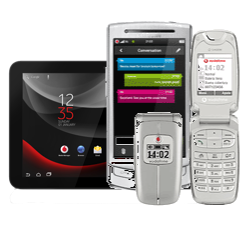 We provide unlock codes for all Vodafone models. Avoid paperwork by unlocking your Vodafone yourself. Our method is recommended by the phone manufacturer. Unlock your phone in the fastest time possible. How to unlock my Vodafone with doctorSIM? Once you've requested your unlock code, we'll send simple step-by-step instructions on how to complete the process to your e-mail. Type in the unlock code to permanently unlock your Vodafone. There is nothing more to it! What do I need to unlock my Vodafone? 1. Your phone at hand and to be able to access the keypad and drop-down menus. 2. The IMEI of the phone. The IMEI is a 15-digit number which you can obtain by dialing *#06# on your phone's keypad. Yes, once you have unlocked your phone with doctorSIM you will never have to repeat the process. Feel free to restore your Vodafone to factory settings and update the phone's software as normal. Can I use my Vodafone abroad? Yes, once unlocked your cell phone will work on any compatible GSM network in the world. Extortionate roaming fees will be a thing of the past. Can unlocking a Vodafone cell phone damage it? No, doctorSIM unlocks phones via IMEI. This is the unlocking method recommended by the manufacturers themselves and does not damage the phone's software or hardware. Will unlocking my phone void the warranty? No, your Vodafone's warranty will remain intact. Why unlock my Vodafone at doctorSIM.com and not at a local phone store? Our IMEI-based unlocking services are legal, permanent, don't void the phone's warranty, and aren't invalidated by future software updates. Additionally, your phone is never out of your sight because you unlock the phone yourself by inserting an unlock code. What happens if my Vodafone is under contract? You can still unlock your phone even if you have signed a fixed-term contract with your network provider. You will have to pay your monthly bills until the contract expires or pay an early cancellation fee, but at the same time, you'll be able to use your phone with other network providers. If you stop paying your monthly bills, your phone will almost certainly be blacklisted by the carrier. Unlocking your Vodafone by IMEI will not void the warranty. We will return your money if we are unable to unlock your cell phone for any reason under our responsibility. We will send you step-by-step instructions to your e-mail on how to complete the unlocking process. Cell phone unlocking experts available by e-mail and chat if you require assistance. Unlocking your Vodafone online at doctorSIM is permanent. Multiple 100% secure payment methods at your disposal. Unlock your cell phone without damaging the hardware or software. Continue to use your Vodafone while it is being unlocked. One unlocking service unlocks all models.